I have a note on my bathroom mirror that is a constant reminder and annoying little motivator to better myself for an event. I am known for sticky-noting my office spaces with little notes to myself because I am more likely to remember it seen on a paper near a place I walk by all the time than a beeping little reminder on my phone that I turn off and forget. 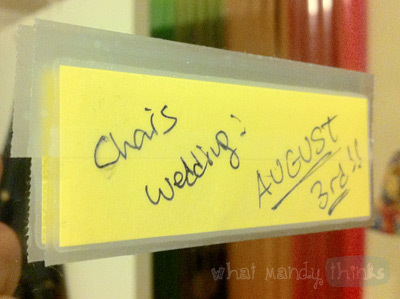 Today's Simple Pleasure of the Day is posting reminders such as this one that notifies me of my sister's wedding is in six months so I should whiten my teeth and flatten my stomach as healthily as possible until that day. "Char's Wedding: August 3rd!" so I'd better get a move on! - Your chance of remembering / doing whatever is written. - Your chance that doing whatever's written will happen in a timely manner. - Your chance of getting annoyed by it pretty quick. I'm probably going to have very cranky mornings where I see this note on my mirror and want to curse at it. The closer I get to it, the greater the chance I will break out the curse words on a regular basis unless my goal of nice teeth and a not-as-notable gut is achieved. I do the SAME THING! I have one on the shelf next to my mirror to make me work out more!